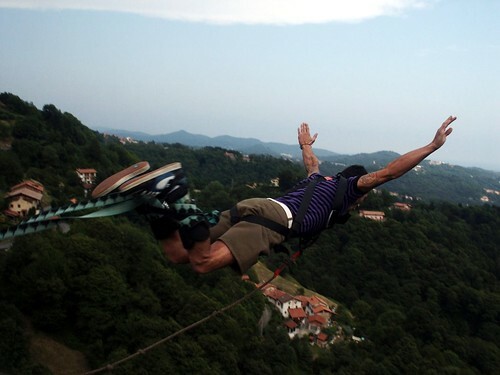 "Bungee" by Strocchi on Flickr. I'm taking today to finalize my syllabus for the ENGL1102 courses I'll be teaching this fall. Classes start a week from tomorrow, so it's probably a good idea for me to get a move on. Last night I shifted my plans somewhat and made the decision to conduct the entire course in WordPress (except for the absolute minimum in the LMS for essay submission and grading purposes). This is not a complete surprise - I've used WordPress as a central component of the composition courses I've taught at Georgia Tech for the past two years. But in the past I've dabbled in other platforms as well: Mediawiki and Twitter, primarily. This semester I'm going to use WordPress as the core of the work we do. I want to see how far I can stretch it to reinforce the multimodal foundation of the writing and communication courses we teach here. My course topic is Shakespeare's approach to English history. Using Henry IV, Parts 1 & 2 and Henry V, I want students to consider how propagandistic the writing of history can be (I'll never forget a college friend of mine who insisted his understanding of English history was based entirely and unabashedly on Shakespeare's plays - he stated this with pride and without irony, and was surprised when he learned that Richard III probably didn't have a hunchback, etc. etc.) I also want them to think about how they read what they read: demonstrate to them through the plays that everything we read relies on editorial intervention. So we're going to look as much at the editions' introductions and notes as we are at the plays themselves. Granted, they're reading the Pelican editions, so it will be a gentle introduction to editorial work, but I'll also have them read the introductory materials for James Mardock's Internet Shakespeare Editions Henry V.
"King Henry V" by unknown artist, Wikimedia Commons. We'll look at Holinshed's Chronicles via The Holinshed Project. They'll read biographical entries on historical figures in the ODNB Online. And because I get giggly about things historical with the best of them, we'll be looking at 1066 and All That and The Terrible Tudors. For good measure we'll watch excerpts from Olivier and Branagh's sometimes ridiculously propagandistic film versions of Henry V. Oh: and to top it all off each of the three sections will transcribe and edit their own digital edition of The Famous Victories of Henry the Fifth, using the 1913 Tudor Facsimile edition as their base text. Ten substantial blog posts designed to prompt contemplation of some aspect of the plays, the sources, and the adaptations. Students will also be responsible for submitting a substantial comment on the work of a classmate each week. I'll take a cue from Katy Crowther's hub-and-spoke student-moderated approach to blog assignments. Posts will reflect the multimodal nature of online publication - compelling, well-formed textual pieces reliant on other media elements in order to successfully represent an argument or opinion. Two thematic essays (I'll fill you in on topics in weeks to come - haven't quite thought those through yet); while the essays will be submitted in traditional word processing documents, students will document their writing and workshopping process in blog posts and comments. A short-research project submitted as both an in-class presentation AND through the site. This represents a point of difference for how I conduct this assignment. In the past I've had students create a knowledge base in the form of a wiki to complement the oral presentation they make. I then have classmates tweet visceral constructive feedback while the presentations are being made. This time each student will submit an abstract for their presentation in a section of the course site. As each student presents their research to the class, their peers will submit a comment linked to that abstract. This consolidation of commentary will, I think, make the feedback process more fluid. Rather than engage with another social media platform (Twitter) which sometimes restricts or distracts student as they give feedback, the inline comments will act as a form of free-writing. Students won't have to type in the proper hashtag and username, and then limit themselves to the 120 remaining characters. And the bonus for me is that I won't have to scrabble to scoop the resulting tweets into a viable feedback stream for the presenters. And extra bonus for me, presenters will also submit their properly-formatted-in-MLA research bibliography to the site. So I'll be able to properly review their properly formatted sources (textual and image). The big kahuna assignment is the collaborative digital edition of Famous Victories. As some of you know, I beta-tested the idea of a student-driven digital edition last fall with Tarlton's Jests. That version was wiki-based, and more individually cobbled together components than a fully formed edition. This time I'm looking at a much more scaffolded approach: each student will be assigned a segment of the play to transcribe. [nbnote]In the Tarlton's Jests version, students collaborated across all three sections of the course. This time each section will be responsible for developing their own edition, thereby maximizing opportunities for group as well as individual contributions. [/nbnote] Groups of five students will then be responsible for compiling a section of the play into an act-like division (meta-lesson about super-imposed act divisions goes here), along with glosses and notes using the OED online. I'm going to give as much editorial responsibility to each class as possible, with the goal of having them understand the process, scholarly and aesthetic components of an edition. They will reform into committees responsible for group-writing sections of the introduction, incorporating historical background, context, performance history, sources and influences, textual notes, etc. And again, all of this will flow backwards and forwards through the course site, remediating research projects and blog posts. Ultimately, hopefully, each class will produce a comprehensive and polished edition. This is another in my never-ending bungee-jump teaching experiments. It might be an utter disaster, but I'm building in enough failsafes to ensure that the students achieve the learning outcomes identified by the Writing & Communication program, Georgia Tech and the Board of Regents of the University System of Georgia. Whether it succeeds or crashes and burns, I'll be back to let you know.